So what does make Portland uniquely Portland? Oregon’s largest city is known for being different, weird if you will. It has a green fetish that’s hard to ignore, trendy restaurants, a great mass transit system, and an affinity for two types of beverages: coffee and beer. This is my second time visiting Portland. A couple of years ago I was there with my parents for a few hours but really wasn’t there long enough to pick up what kind of vibe this place was laying down. We managed to hit only one brewery, Deschutes, and a couple of blocks away, Powell’s City of Books and that was pretty much it. On my second and most recent visit, this time with my wife, we had four days in which to try to get to know this city a little bit better. So back to the question of what makes Portland unique. First, Portland is a very green city, and in more ways than one. So has anyone ever told you that it rains in Portland? It’s true, very true! All that rain maks the city very green! Most of the grass was still green, like Irish green (keeping in mind that we visited in December) and there were evergreen trees all over and around the city. In most places, rain normally forces people back into their homes but if you let the rain stop you here, you would never see the light of day (notice I didn’t say “you would never see the sun”?). Portlanders seem to accept a rainy day as just part of life and they just get on with it. They dress for it and then get out there on their bikes or walk and get to work. The ‘other’ green is their environmental consciousness. The mass transit system here is very good and that helps to cut down on air pollution and traffic. They even have a bridge across the Willamette River, Tilikum Crossing, that is closed to automobile traffic. There were many cyclists, pedestrians, light rail trains and buses using the bridge but even with all of that, the bridge never seemed crowded. I can’t help but see just a touch of irony here though. Portland was once nicknamed ‘Stumptown’ due to it having more tree stumps than actual living trees. 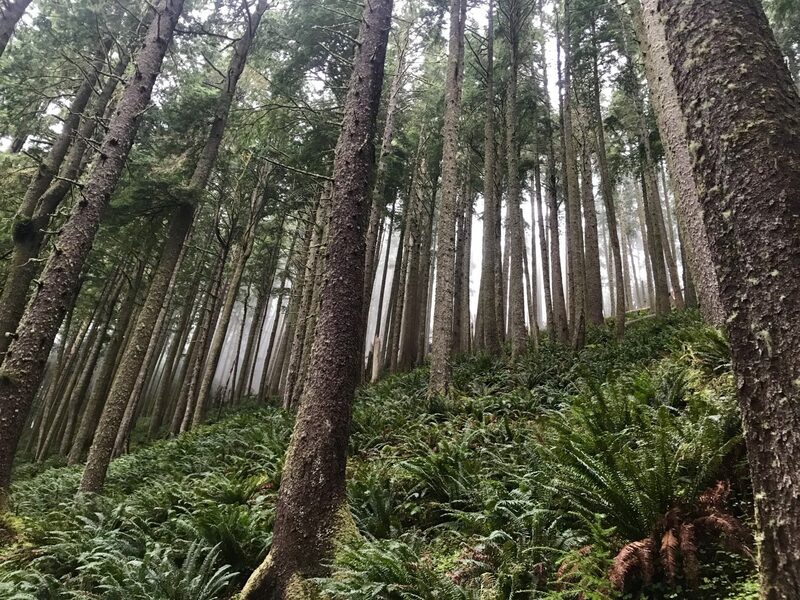 Also, if you take Highway 26 west out of the city towards Cannon Beach, you’ll share the road with countless large logging trucks, trucks that are bringing timber from the forests that lie between Portland and the Pacific Ocean. You’ll see evidence of numerous clear cut areas as you continue west and it is just a bit depressing, especially when you see just how slow the replanted areas are growing. But I get it, it is a renewable resource, it’s just a shame to see how much we use and the devastating affect it has on the environment. And lastly on the green piece (pun intended), the soccer team that represents the city, the Timbers, have a logo that is primarily made up of an axe. That logo isn’t only symbolic of its past, but also of it’s present. Not the greenest symbol around, especially for a city famously known for it’s progressive green thinking. For the foodie, the locavore movement here is strong with it’s ‘think globally, source locally’ mantra woven into the fabric of the Portland food scene. Weekend markets are found all over the city and create an almost small-town feel. One trending restaurant theme is the ‘dining hall’ and Portland has a USA Today top five rated one in the Pine Street Market. This dining hall is in the resurrected historic Baggage and Carriage building and has plenty of character. The market houses a variety of different restaurants including ones featuring ramen noodles, Israeli street food, and even an upscale hot dog vendor (my favorite). Lastly, no trip to Portland would be complete without stopping by Voodoo Doughnuts for some of the most creative doughnuts anywhere. So living in the rainy cities like Portland and Seattle, people need coffee to get going, much more than let’s say sunnier climes like Miami. This means coffee shops can be found everywhere. Starbucks got its start a couple of hours north and is now a household name around the world. Stumptown Coffee from Portland is one of the more popular coffee shops and is also a household name, at least in Portland it is. I love hearing how a small business like Stumptown Coffee is doing so well but was disappointed to hear that it was purchased by the much larger, Luxembourg owned, Peet’s Coffee. And lastly, Portland is known as Beervana! It does deserve this title and it boasts breweries all over the city. I think I heard that there are over 70 within the city limits. So we tried a couple of those within the city limits, and even a couple out on the coast. Within the city, we checked out two in the Pearl District: Deschutes and Rogue. Both had good beers, but extra props to Deschutes for their food and comfortable, bright atmosphere. So here’s the thing, Portland has an outstanding microbrew beer scene but there are a lot of places that can claim that they have a great beer scene too. Like say San Diego, Boulder, Asheville, and countless others. What does Portland have that the others don’t? When I think on microbrewed beer and where it came from, I think of Portland! It also just feels like the kind of place where beer ‘should’ come from, certainly not San Diego (no offense intended San Diego). So what makes Portland, Portland? I still don’t know! I think I came here looking for the Portland that you see on ‘Portlandia’ and really didn’t find that (maybe that’s a good thing). Places like Voodoo Doughnuts, a Portland original, don’t even scream “That’s so Portland” to me. I think Boulder Colorado has enough breweries to make Portland not seem as unique as maybe it once was. There is a slogan in Portland that reads “Keep Portland Weird” and that saying, minus the Portland part, was actually started in Austin Texas as “Keep Austin Weird”. It’s most famous coffee shop is now owned by a foreign entity. It has a homeless problem. It has beautiful parks. The people are friendly. The people are active. There actually is a lot of flannel being worn. There are also beards, lots of them. It is a city of contrasts, green but with a dark green past. It is a city, much like any other city. It has some uniqueness, weirdness if you will, but not as much as I was expecting, hoping for. I didn’t love Portland, I liked it! And did I mention that it rains there?